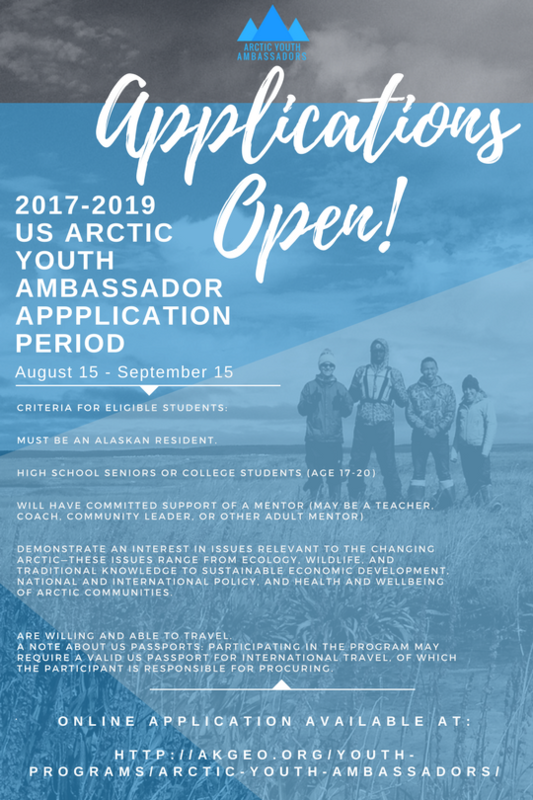 US Arctic Youth Ambassador Program is pleased to announce that they are recruiting for the 2017-2019 Cohort of US Arctic Youth Ambassadors! A nominator should know the student very well and be able to speak to the student’s leadership abilities, strengths, and space for development and growth. · Transporting students to and from airport. It is possible for the nominator and mentor to be the same individual. If this is the case, they must fill out both forms. An online application is preferred. A paper application is also attached to this email. · Must be an Alaskan Resident. · Demonstrate an interest in issues relevant to the changing arctic—these issues range from ecology, wildlife, and traditional knowledge to sustainable economic development, national and international policy, and health and wellbeing of arctic communities. · Students who may not have had these types of opportunities in the past but would contribute and gain a great deal. · A note about US Passports: Participating in the program may require a valid US Passport for International Travel, of which the participant is responsible for procuring. The U.S. Arctic Youth Ambassador Program was created by the Alaska Region of the U.S. FIsh and WIldlife Service, the Department of State, and nonprofit partner Alaska Geographic in 2015 under the auspices of the U.S. Chairmanship of the Arctic COuncil. The partnership continues during the 2017-2019 U.S. Chairmanship of the Arctic Council’s Conservation of Arctic Flora and Fauna Working Group. The CIRI Foundation publishes the Education Resources Handbook to provide education and career planning information for The Foundation’s beneficiaries as well as for others who are interested in pursuing a successful career after high school. The handbook contains valuable information to assist in preparing to attend a post-secondary education program including financial aid, internship, fellowship, and training opportunities. In addition, there are reference materials about other educational support services at the post-secondary level. Click HERE to view the Education Resources Handbook.